AVS Audio Editor is a feature-rich audio production software that combines advanced audio editing features with an easy-to-use ribbon-based interface, which makes it suitable for both professionals and amateurs. 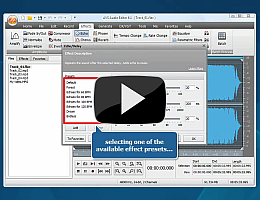 customize AVS Audio Editor settings to meet your specific needs. To start AVS Audio Editor go to Start menu and choose All Programs -> AVS4YOU -> Audio -> AVS Audio Editor. How to record voice over an audio track using AVS Audio Editor? How to normalize volume level for a group of audio tracks?